Every full moon gives you an incredible opportunity to harvest powerful energy to use in many areas of your life. The abundant energy of a full moon can help fuel future manifestations and re-energize your body and spirit. It can be done in many different ways and by using rituals. The full moon water ritual is one of many. You should choose it for when you would like to literally drink the energy of the moon. This water is healing and can be used to cleanse from low-vibrational energies, balance the chakras, and even help heal the physical body. Water can hold enormous amounts of information as is seen from famous research by Dr. Masaru Emoto. This Japanese researcher found that frozen water changes the way it looks based on what words it hears around it. If positive and loving—water freezes beautifully and perfectly when the words are mean and hateful—it looks all broken down. This research has been expanded upon by German Professor Boris Koch whose team of scientists confirmed that water holds memory of every being or item that it came in contact with. As you can see, this process goes beyond words. Water can absorb the energy of thoughts and intentions, as well as different astrological events. This is why charging water during the full moon is powerful; it can become a life-changing tool for you to use. If you would like to have a pitcher of water absorb information from full moon’s energy, the process is simple. What matters the most is your intention and your own energy during this process. Your own energy will affect the water as well, so make sure to meditate beforehand, so to make sure your thoughts are positive and pure, and your energy-field is grounded and in balance. A simple meditation, a quick safe burning clearing, or a breathwork exercise can do the trick. glass container—a bottle, a glass, a pitcher, or a jar. Glass is one of the purest materials to use as it contains no toxic chemicals like plastics. Because it is clear, unlike wood or metal even, the energy will go straight into the water instead of the container itself. Fill the container of your choice with as much filtered or distilled water as you would like. A fuller container will look more abundant, so go by intuition and what looks just right. If you feel called to do so, decorate the container in any way that feels right. You may choose to write inspirational words, quotes, or messages on it with a sharpie. You can surround it by gemstones. 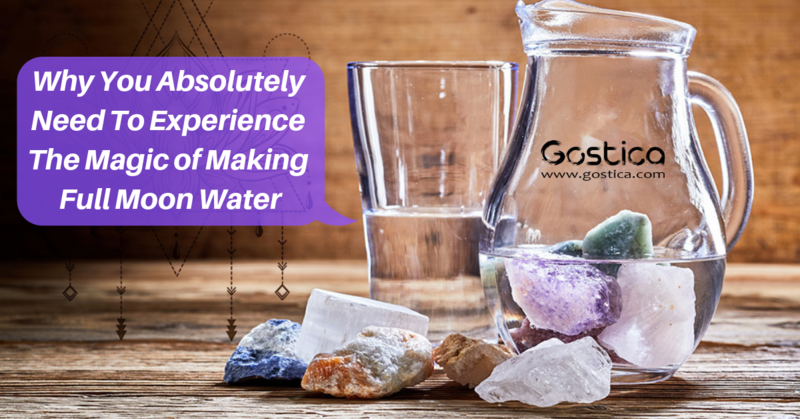 (If you place gemstones into the water, make sure to do the research about which ones are safe to use for water infusions). You can also surround the container with flowers and leaves, or place flowers to float on top of the water—this is popular for sisterhood gatherings. Finally, you may choose to use candles, either place some around the container or put a few floating candles in the water. After the container looks like you want it to, cover it, and place outside if possible or a windowsill that is closest to where the full moon is in the sky. You want the water to absorb as much of direct moonlight as possible. You can leave it out earlier in the day to gather sunlight and moonlight, or just leave it for the night. The last step is to put a blessing or an intention on the water. Before leaving it for the night, place your hand on or over the container and ask it to be charged with the energy of abundance as well as ask for it to bring light into a specific part of your life. Your own intentional request should sound in the way that makes you feel empowered and inspired to live your best life forward. When you collect the full moon water in the morning, the ritualistic next step is to say another blessing, confirming the intention you have placed on it the night before, and take the first sip. If you would like to use this water following the traditional ritual, you should take a sip of it every morning before eating or drinking anything else and make it last exactly 28 days until the next full moon. You can also leave it for a special occasion or need, especially if you have charged water by a unique full moon such as one during an eclipse. The energy will also vary depending on the month and year, and you can read about each individual full moon from astrologist to get a sense of specific information each full moon brings. When the special occasion arises, when it fills right to use this charged water, you can drink straight from the container, or make a blessed tea using this water. Finally, you can leave the water until you need a blessed cleansing, as it will help purify your body and energy field. When that moment arrives, you can still drink from it, or use a little to refresh your face or put a little bit of water on your third eye. Full moon water is a tool, so you should feel free to experiment further how it can best work for you. If an idea comes to you for another way to use it, trust your intuition and do so. Why don’t you have a link to share articles via email and social media like any other blog? Its a little unprofessional.